Welcome! It’s great to meet you. Thank you for stopping by! We have some party hats over here for you to put on and you can grab some confetti to throw around. If you blog about crafts, DIY, blog designer, etc., be sure to sign our guest book by adding yourself to our craft blog directory here. We would love to also feature you! If you would like to be featured, just click here! If you added yourself to the directory above, no need to fill it out twice! We will just send you a questionnaire! Oh so much you can do here, you might want to call up, I mean, tweet, your friends and tell them to stop on by too! 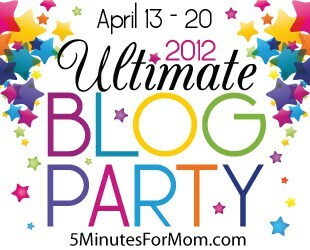 If you are stopping by from The Ultimate Blog Party, please leave your link below so I can be sure to stop by and visit you! LOVE the community you have here! I don’t think I would have ever stumbled upon your blog if it wasn’t for UBP! Thanks for having such a great site! Great Concept! Love your site!! Interested to find out more info! Visiting from the UBP! Thanks! So glad that I found your blog! I love crafting! I am delighted to meet you thru UBP12 and look forward to connecting with you and your community! I invite you to visit me at Create With Joy to learn more about my creative community as well! This week’s Inspire Me Monday is up and you are welcome to share with us there as well! I hope you are enjoying the party so far! Stopping by from the UBP party. Great to see your blog – I can’t wait to check out all of the features! Found you through the UBP12!! Signed up my blog for the crafty blogger network! Thanks for hosting! !